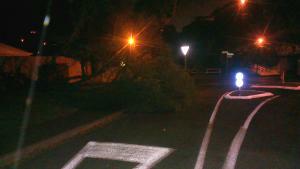 A tree has been uprooted and fallen onto Melbourne Road near the intersection with Mersey Street & Melrose Road. The tree fell sometime after approximately 8:45pm on Thurs 12th May. The attached photo was taken at 11:30pm on Thursday 12th May.